Simply put, I love bread. Even more so, I love breads that taste homemade and have a delicious soft dough. Put me in front of a bread table and I go weak at the knees. I was recently able to try SUPERPRETZEL Bavarian Pretzel Breads and I'm hooked! 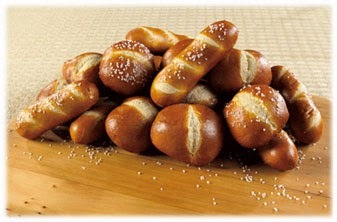 Bring the restaurant experience home with SUPERPRETZEL Bavarian Pretzel Breads. Old world style pretzel breads, made with premium ingredients are now available in your grocer's frozen bread section. Fully baked and microwaveable these soft pretzel sticks and rolls are versatile, making them the perfect side to any soup or salad. SUPERPRETZEL Bavarian Pretzel Rolls are round and shaped like rolls. The Bavarian Pretzel Sticks are elongated. There are eight to each package (although I got lucky and received ten of the sticks in its package!). They can be microwaved or cooked in the oven. I took the oven route for the rolls and the sticks. It takes about ten minutes for them to cook in the oven. There's a salt packet in each package so you can spritz water on each stick or roll, then add the desired amount of salt. Both the sticks and the rolls were soft and, dare I say, tasted just like homemade rolls! I didn't have a favorite but the rolls seemed to have more dough density. I'll definitely be purchasing some in the future to satisfy my appetite for delicious bread. I was just telling my son Isaak that I should make pretzels for him. There was a sample at the mall. He apparently has never had them. Instant love. Bread is my weakness too and this pretzel bread looks delicious. These sound and look really good. I would love to try them with our meals. I am disappointed though, we don't have them in our area yet. I'd eat them all in one sitting. I have a real weakness for pretzels! I would LOVE to try this bread...I hope it is super soft.